Holding a toad-sized hawkmoth lured in by our sheet and black light. O.K., I did know what a proboscis was before my trip to New Mexico last month. 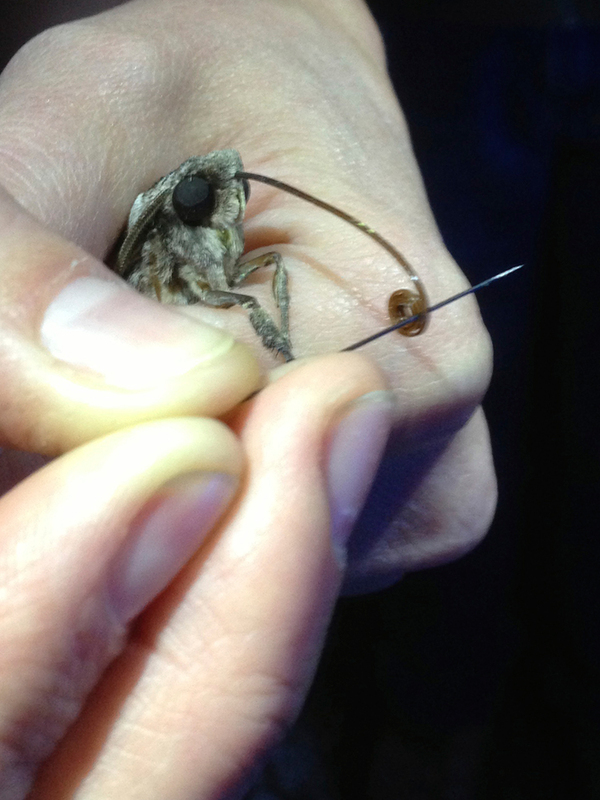 But learning how to uncoil a hawkmoth’s 3-inch nectar-sucking hollow tongue while trying to calm the toad-sized insect in my hand was the biology lesson of a lifetime. Thanks to Chicago Botanic Garden scientists Krissa Skogen, Ph.D., and Wes Glisson (who recently earned his master’s degree in plant conservation biology from the Garden/Northwestern University graduate program), and Bureau of Land Management (BLM) New Mexico state botanist Mike Howard, I learned about hawkmoths, the plants they pollinate, and how to collect plant cuttings for scientific study. 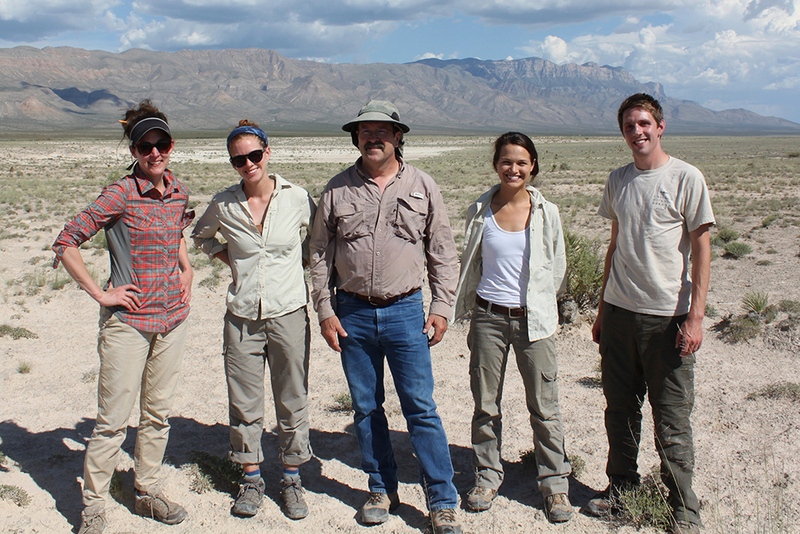 I also had the opportunity to meet and work beside two remarkable interns, Kate Wilkins and Elisabeth Ward, from our Conservation Land Management Internship Program (and enjoy a few absolutely perfect hours of exquisite silence in the desert at the foot of the Guadalupe Mountains on the New Mexico/Texas border). The exquisite silence and panorama of the New Mexican desert. I had been asking around the Garden’s scientific staff to see whose fieldwork would fit with my summer schedule. Krissa was planning a trip to southern New Mexico to film an episode of Chris Martine’s great video web series Plants are Cool, Too. Krissa’s episode, which will air in October, highlights her work on long-distance pollinator movement, focusing on Oenothera harringtonii, an evening primrose endemic to southeastern Colorado and other closely related Oenothera species. The flowers of Oenothera harringtonii and many other evening primroses open soon after sunset and are pollinated primarily by hawkmoths. These moths feed on the nectar of Oenothera flowers, which they locate by the strong fragrance produced by the flowers. We commonly think of floral scent for its role in attracting pollinators, but it may also be used as a cue by floral and seed predators. By studying the shape, smell, and color of Oenothera flowers, Krissa and her colleagues hope to determine what it is that attracts pollinators to these flowers. She can also determine how the plants “reward” their pollinators by studying nectar—how much flowers produce and how much sugar the nectar contains. And lastly, by collecting pollen grains from pollinators, Krissa can determine which plant species the pollinators rely on most, which brings me to catching hawkmoths and collecting pollen from their tongues. Krissa gently rolls out the proboscis to show us just how long it is! The first night of our trip, we set out to find some hawkmoths. After visiting a couple of sites in the Organ Mountains, we found them. 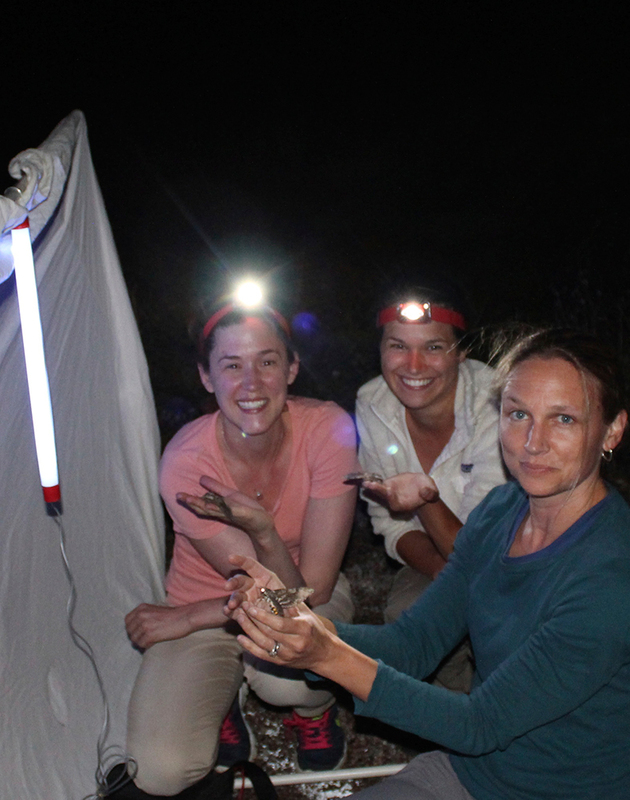 Above is a photograph of Dr. Krissa Skogen, Elisabeth Ward, and me holding the toad-sized moths we attracted to a blacklit white sheet held up on a PVC armature. After sunset, the hawkmoth uses its long hollow tongue to extract the nectar from deep down within the narrow mouth of the flower. The moth’s nightly journey often covers a distance as far as 20 miles. Krissa gently rolled out the tongue to show us just how long it is! The next day, we set out early to collect Lepidospartum quamum for our colleague Evelyn Williams, Ph.D. Evelyn, a post-doctoral researcher, has been working with Jeremie Fant, Ph.D., Kayri Havens, Ph.D., and Mike Howard on this plant since 2012 in an attempt to figure out why it is threatened with extinction in this area of New Mexico. The plant grows in a unique environment—the gypsum salt flat. 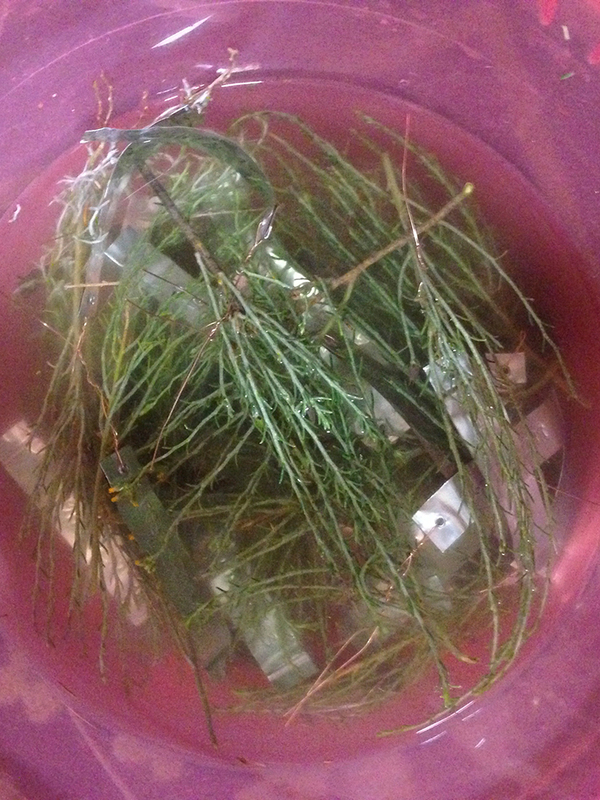 Lepidospartum quamum cuttings, tagged and ready to be sent for propagation in our greenhouses. Evelyn’s previous collecting trip this spring needed to be supplemented with new cuttings. We worked all day to collect the cuttings, which we sent back to the Garden for propagation in our production greenhouses, as well as samples for genotyping in the Garden’s Harris Family Foundation Plant Genetics Laboratory. 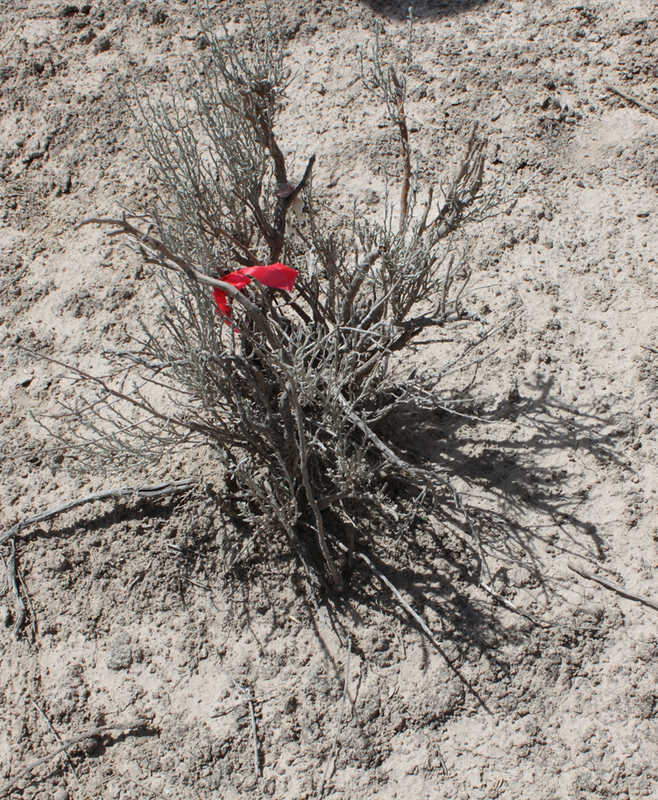 This important work, which ultimately aids seed growers, restoration practitioners, and government agencies to select appropriate plant materials to restore diverse plant and animal communities, was funded by a National Fish and Wildlife Foundation (NFWF) grant as part of the Native Plant Conservation Initiative. It’s a fact that most people are more attracted to animals than plants—and therefore more inclined to know their names and fight for their survival. 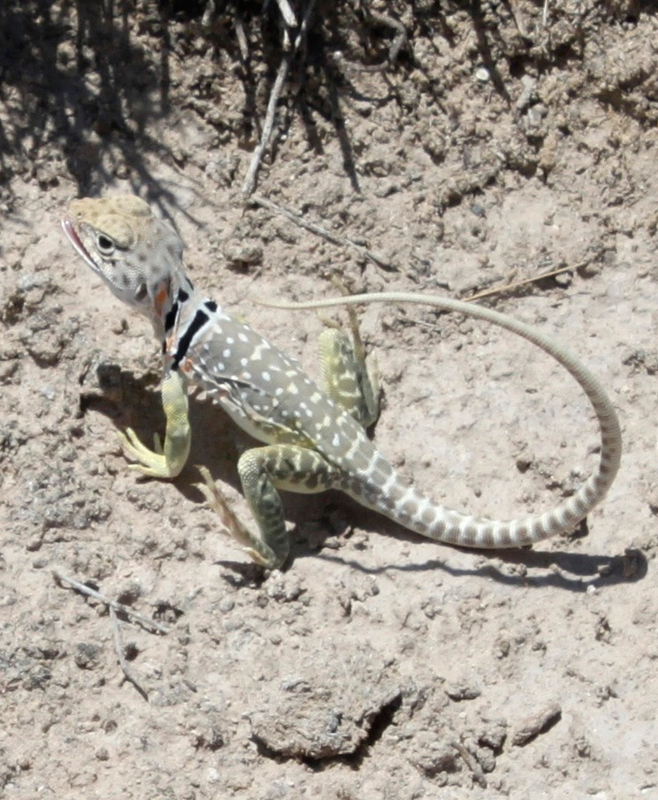 Just compare the following two photographs—the Lepidospartum quamum specimen we were studying, and this lizard that darted by and immediately commanded our attention (yes, even botanists and plant-lovers are drawn to a cute face). But all life depends on plants and the healthy habitats on which they depend. When we think of fighting to save wildlife, let’s remember that wildlife includes plants! I am hopeful that by working with collaborations from gardens, zoos, government agencies, and other land-trust and conservation organizations, we can integrate plants into wildlife action plans both in the U.S. and abroad. I particularly like how this report by NatureServe summarizes this issue. We can all point to moments in our life—when we’ve experienced something new or met someone special—when our understanding of life changes. My two days with these five scientists—at all phases of their careers—was one of these experiences I will never forget. Thank you, Krissa, Kate, Mike, Elisabeth, and Wes! One last note: Hawkmoths are essential to ecosystems from Venezuela to here in Chicago. My son and I watched one this afternoon drink from the hostas on our street! Below is one we filmed in the English Oak Meadow of the Chicago Botanic Garden last week.